Today we’d like to introduce you to Allison Ducharme. Interior Design has been my passion from as early as I can remember. A lot of my influence and aspiration of design and artistry comes from my father being a furniture designer, so I was (and still am) constantly surrounded by creativity. When I was in High School, my admiration for décor increased and I was always excited for the latest furniture and accessory catalogs (Crate & Barrel, Anthropologie, etc.). I would then list certain items within these catalogues for Birthday and Christmas gift-ideas. I was always excited to update my bedroom “look” and evolve my interior creativity. When applying to colleges, I knew I wanted to turn my continuously growing childhood interest of Interior Design into a career, and I earned a degree from Wentworth Institute of Technology. While in college, I wanted more “hands-on” experience outside my courses and semester-long projects so I interned at Ethan Allen and worked at four well-known design/architecture firms before graduating college. 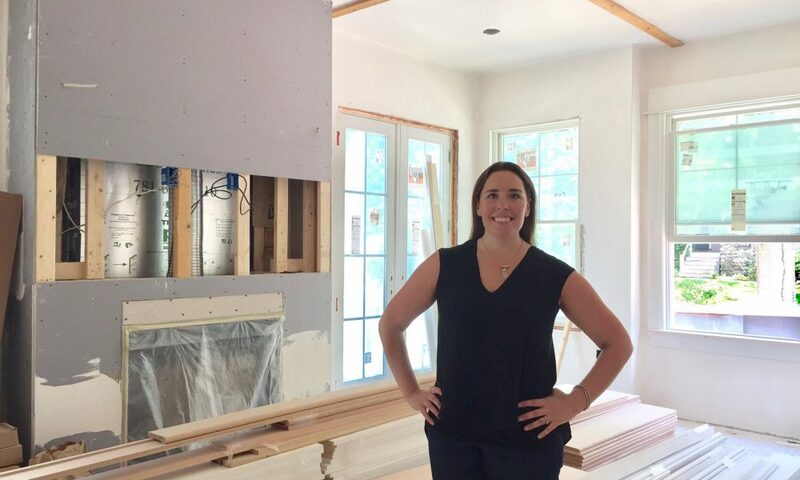 I am thankful I had the opportunity to work at all of these companies as well as others following college, as they continuously and tremendously deepened my skill set and allowed me to build a level of confidence and experience to open up my own business, Allison Ducharme Interior Design. The main challenge I continue to face (which I believe is the case for most people starting their own business), is keeping a constant flow of new clients. I have been fortunate enough to retain clients from previous projects/companies (due to the clients’ request) generating around 60% of my business coming from referrals; however, I continue to prospect and market myself and my services on Facebook and Instagram as I am always looking to expand my portfolio. Allison Ducharme Interior Design – what should we know? What do you guys do best? What sets you apart from the competition? I specialize in Luxury Residential Interior Design, and while I work with clients from Newton, MA all the way up to Windham, NH I do not limit myself to a specific mile range – as long as it’s still in New England! My expertise is designing living spaces by incorporating carefully selected, comfortable, and stylish furniture with beautiful fabrics and finishes. I always include a few variations for the client to review to guarantee their personal preferences are met, while also allowing them to be part of the process. I work with my clients to guarantee the final design is as personalized and perfect as possible. I tend to gravitate towards unique fabric combinations and textures, natural elements, gorgeous light fixtures, and classic furniture to create an overall enjoyable and personalized space where my clients can relax, entertain, and are proud of their home. Also, I enjoy incorporating bright pops of color into every space to make it fresh and fun. I value every single client and project, no matter how big (i.e. full house redesign) or small (i.e. staging project). I respond to phone calls, texts, emails, and social platform messages in a fast, prompt and professional manner. The proudest moments for me, are when all of the finished details are in place, and my clients express their appreciation and excitement for the final look. It is the best feeling to have started by helping clients figure out their “dream design style” and then bring it to life for their ultimate enjoyment. I define success as going above and beyond, always over-delivering to my clients, and having a never-ending passion. I believe not only having a strong passion but keeping that passion alive will encourage hard-work and inevitably, success. In addition to the above definition, my success also comes from always wanting to grow and learn, which I apply to my personal life and professional life. As a businesswoman and designer, I am constantly seeking out new information whether it’s in the form of a seminar, trade article, or design books and websites. I also follow many designers on social media to draw admiration and influence from on a daily-basis. My clients have also contributed to the success of my business, as (mentioned earlier) I have generated a lot of business due to referrals as well as repeat business. I am lucky to have the opportunity to build long-lasting relationships by working with certain clients on multiple occasions/projects, as I know a high level of trust has been established.